When I was in high school I really messed up an opportunity to love thy neighbor. I became rather good friends with Arthur, one of the most introverted kids I have ever met, who sat next to me in Ms. Bobbit's sociology class (yep, that was her real name). We had many good laughs in class, I usually getting the blame for disrupting discussions or yet another of Ms. Bobbit's conspiracy laden rants about the U.S. government. We had our fun, a sort of Penn and Teller high school friendship. As the year went on, I mustered up an invitation for Arthur to join us on a youth retreat. He came and over time developed into one of the more active members in the youth ministry. Arthur even came to know Jesus and committed his life to follow Christ. It was awesome to witness. Then we learned something. As many of us had earned his trust and friendship, also being blessed by his wisdom and generosity, Arthur shared with us that he was gay. He thought he could let us in on something that made up a bit about who he was, nothing extravagant or flamboyant, just a part of his identity he wanted us to know. After all, we were friends and fellow travelers on the Christian Way. This was almost 14 years ago and our youth group did not know how to respond. I am not sure he knew how we would respond. But I know we did not respond as he hoped, certainly prayed for, and definitely not how Jesus would have invited us to extend love and grace. We were unwilling to be friends with him anymore, choosing our religious and social reputations over Jesus' call to love neighbor. I recently shared this story with a group of teenagers at the Philadelphia Project, as we reflected on the well-known parable of the Good Samaritan. An anonymous man mugged in Jericho, left for dead in a ditch, becomes a prophetic platform for Jesus' interaction with an inquisitive lawyer looking for a loophole to eternal life. Who will offer this victim of violence in the space between Samaria and Jerusalem? The man in the ditch, with blurred vision from being nearly knocked unconscious, can barely make out the first passerby. But his religious attire gives him hope- a priest. Surely someone who deals with sacred rituals of the temple will care for this victim. But alas, he is unwilling to jeopardize his religious status to help someone he does not know, who may or may not be dead. This would risk his ability to perform his sacred duties in the house of God. But what about the next passerby, a Levite. Surely someone who knows the religious law, blesses the religious law, and is even a descendant of Aaron, present when the law was first given, would offer compassion and concern. Yet he was also unwilling to risk his elite status and enter into the suffering of this man. But then comes another passerby. Who knows why the Samaritan was in Jericho, but given their reputation, if a priest and Levite from Israel are unwilling to rescue this victim of abuse, there is no way the Samaritan will be willing. The Samaritan's were written off as mutts of society, they were the offspring of Jewish folk who married foreigners, taboo according to their history and law. They worshipped at the wrong place, i.e. Samaria versus Jerusalem, and read the wrong stuff, or not enough, i.e. they only counted the first five books of the Pentateuch as Scripture. Needless to say, there is no way the hero of Jesus' story, who was merely a first-century Jewish rabbi in the mind of this lawyer hearing the fable, will be a Samaritan. But alas, the Samaritan is the only character who offered compassion to the man in the ditch. The religious leaders were unwilling. They were more concerned about piety. They chose law over love, unwilling to identify with the suffering of this man in the ditch. The same was true for members of my high school youth group when we learned of Arthur's story. The same was true when we witnessed him being verbally assaulted by our peers. But that's not all there is to the story. The Samaritan does more than offer a hand up. He comes near, bandages his wounds, pours expensive ointments of cleansing and healing upon his injuries, saddles him on his animal (Philly Project youth suggested a seagull), takes him to the nearest inn, and leaves two days wages for the innkeeper to care for him until he returns and can pay the remainder of accrued debt and medical fees. . It's as though this Samaritan says to the innkeeper, this man does not have medical coverage, but here, I have found a way to put him on my plan as my dependent. I will pay all co-pays, all prescription fees, all deductibles. Protect him from further harm. Care for him as if he was a member of my very own family. And I will return to settle up and make sure this man can get back on his feet. Things will be right again. I think something is often missed in this parable. This story is really about the storyteller himself. 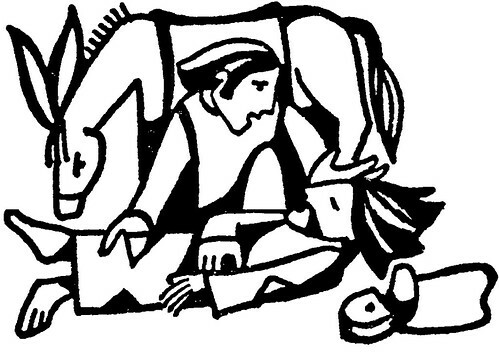 The real punchline of this parable is Jesus' identifying himself with the Samaritan. Jesus is the one who came near to broken and abused humanity, took pity and exercised compassion on those the rest of the world, to include the religious elite, had written off for dead, and was willing to not only claim us as his own, but also pay all present and future debts through his death and resurrection. Jesus is the one who neighbors among us and shows radical mercy to all those abused by and caught within systems of exclusion and violence. And Jesus, like the Samaritan, will return to make all things right in the end. But I think there is a character who is overlooked in this story. What about the innkeeper? I wonder if Jesus is inviting the lawyer, the priest, the Levite, and you and I to consider another question. Are we the innkeeper, those charged by the willing Jesus to be willing caretakers and justice pursuers as we look after and speak up for those victimized by all sorts of violence, oppression, poverty, and manifestations of evil? Are we charged to use the gifts and resources God has given us to care for others written off for dead until Christ returns and makes all things new and right? I wish the parable of the Good Samaritan would have been told to me this way when I was in 10th grade. I wish somebody would have invited me to consider Jesus as the Samaritan and all of us in our little Methodist youth group as the innkeepers. Maybe then we would have treated Arthur differently. Maybe then we would have identified him as our own, one of us, versus the "other" who jeopardizes our reputations in school and church. Maybe then we would not carry the question with us, what happened to Arthur? I pray this generation of youth does better than I, as Jesus' innkeepers in a world with way too many Jericho-like assaults. I pray they draw near, take risks, extend radical hospitality, and pursue justice for all those victimized by systems, assumptions, and labels bent on marginalization and oppression. I pray they read Luke 10 and then go and do likewise until Jesus returns and makes all new and right. I pray they never just pass by. Thank you for sharing this part of your life. I love the perspective as I am preparing to teach on this parable and also desire to have people align with what the Inn Keeper is tasked with. Keep up the good work. I think the main point of the parable is that you must love your neighbor in spite of the 'danger" it may bring to you. The danger of stopping by the side of the road to help. The danger of spending money to help someone. The danger of ridicule for helping someone that may not be liked by others.